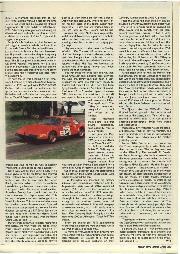 This piece is about four generations of amateur racing drivers. There have been several examples of second generation F1 racers (Ascari, Hill, Andretti and Brabham spring to mind), and the USA is rich with long-established racing dynasties, such as the Unsers. In this country, however, there can be few, if any, other examples of four competing generations. In this case, the first kinsman to take up the sport was Alfred E Cunliffe. Born in 1866, he married in 1901 and served in the artillery during the First World War, until gassed and invalided home. 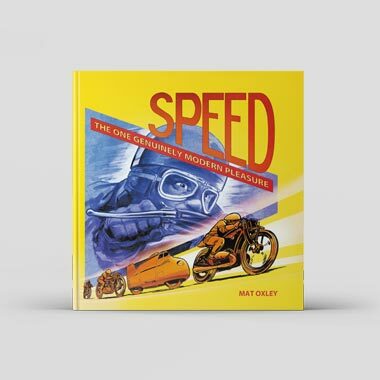 He had owned an early motorcycle and sidecar and, his health restored by the 1920s, he raced a three-litre Bentley at Southport with full touring equipment, even to mudguards and running boards. The family's grain and seed brokerage business had expanded during the war, when feed for carrier pigeons, used for communications purposes, was sought by the military. The first car Alfred Cunliffe owned was a Hillman Speed Model, capable of some 60 mph, with a fine exhaust note from its large copper pipe. The house was approached by a steep hill, which a demonstration AC had refused to climb. The Hillman made a better job of it, so it was acquired and used until replaced by a Vanden Plas three-litre Bentley, in 1923. 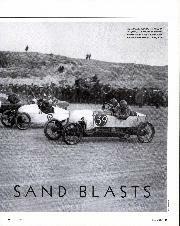 This Bentley was run at the Southport sand-races on beaded-edged tyres, bulb horn in place, the only concession to speed being to open the windscreen. The passenger would ride in the back, leaning out around corners . . .
Unbeknown to his father, Jack Cunliffe, born in 1902, had used the Hillman, after some judicious tuning, in minor speed-trials. His sister, May, was born in 1906 and, as a schoolgirl, was already a competent driver of the Bentley. There is a story of a too-zealous policeman querying the age of the young girl driver and how her mother, from the passenger's seat, stalled the awkward enquiry by remarking that all the Cunliffe family looked remarkably young for their age — "How old do you think I am, officer. . ?" Fast motoring was in the Cunliffe's blood. Jack had begun with motorcycles, the first a two-stroke Scott, followed around 1918 by a single-speed BPS Norton guaranteed to do 70 mph. This was followed by an ohv Norton, a commendably reliable machine which he rode in the 1923 IOM Senior TT and other races. He also rode a Douglas at dirt-track meetings. By now the Vanden Plas Bentley's performance had gradually been increased, until it was suitable for the sports car classes at Southport. May Cunliffe was competing with it in speed-trials at the age of 16. At Southport sand-races her father, whose other sport was pigeon racing, as a member of Manchester Flying Club, went as her passenger. May, whom SCH Davis described as "a driver of real skill", soon craved a faster car. She found it when the red TT type flat-radiator Bentley, which had been used very successfully by George Porter of Blackpool in northern speed events, came on the market. This was the car with which Porter had three times won his class in Southport races in 1923, repeating these successes in 1924, both at Southport and at the Blackpool & Fylde MC's event at Host Bank Sands. It had also set FTD at Stalybridge, covering the standing-start 3/4-mile course at 56.46mph. It also won its class at a Rochdale & DMC sprint. Its chassis and other parts had been elaborately drilled and it had three carburettors, the centre one being a huge Claudel Hobson. When May bought the 1922 Bentley, public road speed events had virtually come to an end, killed off by the RAC ban following the accident at Kop Hill. However, she used it to very good effect, being second to Raymond Mays' TT Vauxhall at Shelsey Walsh in 1926 - 58.2s against 49.4. The Bentley, given a neat radiator-cowl and front dumb-irons apron, also scored many successes at Southport. Stalybridge, where she beat Basil Davenport's 'Spider' and Madresfield. At a Blackpool speed trial it ran out of stopping distance and May crashed badly. The car was rebuilt at the Bentley works with many new parts, including a normal radiator, and was endowed with an enormous Roots supercharger between the front dumb-irons, supplied from a big Solex carburettor. In the wet at Shelsley, she won the 3000cc racing car class, in 53.4s. The cup she gained for winning class 5 still exists. At Stalybridge, it is said that she had used 5200 rpm in third gear. Embroiled in a traffic incident, the prosecution alleged in court that this was a car able to do 45 mph in bottom gear and 90 in top. . . on the track. Her father also drove it at Southport, passengered by Major TK Williams, who was chief tester for Bentley and after the war worked at its Kingsbury Service Depot. Notwithstanding, May sought something even quicker. The Sunbeam Motor Car Company was selling off its 1924 two-litre supercharged Grand Prix cars and she was offered the rebuilt Sunbeam No I, which Dario Resta had driven in the French GP and in which he had later been killed during a record attempt at Brooklands, when the car went through the Railway Straight fencing and caught fire. May paid £700 for it, with a host of spares covering everything down to a roll of insulating tape. After Bill Perkins had introduced her to it, she drove it home wearing a cloche hat, as was the vogue in those days. The Cunliffes drove the car to-and-from race-meetings, and her father bought another Bentley as a tender car, a long chassis 3-litre, with Cooper all-weather body. This had to corner at its limit to keep the GP Sunbeam in sight! The change of racing car proved beneficial. May won four Southport races at one meeting with the 1924 Sunbeam. At Shelsley Walsh in 1928 she was third fastest, clocking 51.2s (a new ladies' record, although the MAC Ladies' Cup wasn't awarded until 1930, when it was won by Mrs Wisdom's Frazer Nash in 53.0s), to the record climb by Davenport's 'Spider' in 46.8s and ELF Mucklow's 50.4s in his vee-twin Frazer Nash-GN. May's time was 2.6s faster than Segrave had managed in a similar car in 1925. He drove on a wet course, but this may not have affected things much when the road surface was rougher. The Sunbeam was, of course, driven to and from the venue. She might very well have gone on to even greater things had not tragedy intervened. Driving the Sunbeam at Southport on June 28 1928, when the beach was firmer than usual, which prevented the wheels from sliding in the corners, the car overturned and Alfred Cunliffe, riding as usual as May's mechanic, was thrown out and killed. May was also thrown from the car, but was virtually unhurt. 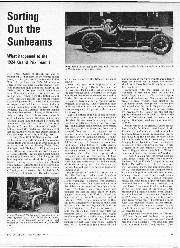 This sad occurrence naturally curtailed future racing plans, and the Sunbeam was disposed of to Jack Dunfee. 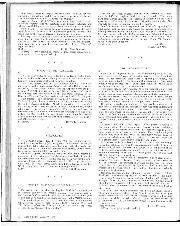 In 1929 May married Harry Millington, who had competed with a 12/40hp Star in sandracing events and was well-known as an official at the Southport meetings. In 1932, their son Tim was born. In the meantime, May's brother Jack retained his interest in the better kinds of motorcycle. He had a Brough Superior which was timed at over 100 mph at Southport and a fast big-twin AJW. These earned him some bonus-money in racing, of which his father, who was a typical amateur sportsman, disapproved. After the accident at Southport, business matters descended on Jack's shoulders, to the extent that he had no time for motorcycle racing. 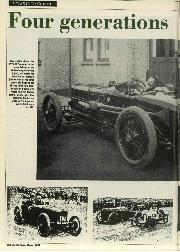 He then bought an fwd Alvis, reputed to be the blown four-cylinder car with which Cushman had finished second in the 1928 Ulster TT. Marriage pensioned that off, but after three months without a fast car the urge became too great and he bought the Brescia Bugatti which FB Taylor had driven at Shelsley in 1925. After fitting new gears and adjusting the Whitehead front brakes, he transformed it into a reliable car, capable of 65 to 70 mph and 40 mpg on a long run. But Jack's wife Pauline tired of all the fresh air and sought a closed car, which she found in an SS, the early 'Sexual Six'. Her husband likened it to a snail with its house at the back. However, this SS proved trustworthy, despite frequently being driven flat-out along the East Lancashire road. 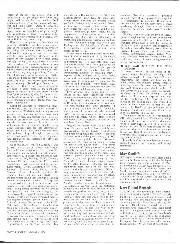 The SS was given a companion when an OE 30/98 Vauxhall was found, for £12, at a dealer. In 5000 miles it was never any trouble, but the compensated front brakes were pretty useless. Jack had it resprayed and later Peter Wike bought it. By now the SS was becoming a bit timeworn. 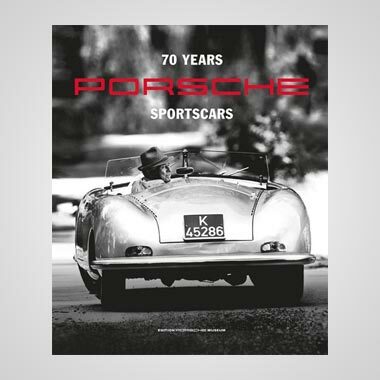 Enthused by a diet of Brooklands Gazettes (which in 1925 merged with MOTOR SPORT), Pauline had recovered her enthusiasm for sports cars, and went south to search for one. Bacheliers had no Brescias but Lane Jones sold her his Type 37 Bugatti. 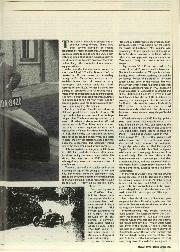 It was as reliable as the Brescia and gave 35 mpg on runs to Shelsley Walsh, until a valve dropped into a cylinder. Jack's wife was by then using a Riley Nine saloon given to her by her father, and this was later replaced by a Frazer Nash-BMW. 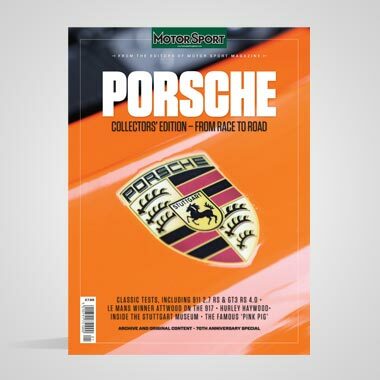 Her husband was able to buy back the Porter Bentley his sister had raced, which had not been looked after by subsequent owners, and restore it to good order. 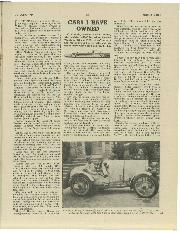 He also acquired another three-litre Bentley Special, which had won its class at the West Hartlepool speed trials. This had ugly bodywork and was exchanged for a Speed Six Bentley. This and the fwd Alvis were laid up when the war broke out and a Standard Nine saloon was pressed into service for the duration, backed up by a BSA Silver Star and an ex-Noel Pope loM Norton for Home Guard duties - and if you do not know what the Home Guard was, ask dad . . .
May Millington returned to motor racing for a time before the war, when she got to know Philip Fontana Jucker. He was running a TT Replica Frazer Nash with supercharged Gough ohc engine. It was hopelessly unreliable and shed so much oil at Shelsey in 1935 that for some time the officials were at a loss as to how to clean it up! May shared the car with Jucker at Donington and elsewhere, where her son Tim got his first taste of the sport. Jucker then acquired a 1 1/2-litre Alta and crashed fatally at the loM races in 1937. Before that he had converted his Frazer Nash into a single-seater with Marshall-blower, and a gear lever on both sides, so that whichever hand was on the steering-wheel the other could be changing gear (or dog). May was entered to drive the Alta at Shelsley Walsh in 1936. The seat did not suit her and a block had been put on the accelerator-pedal to assist her. She got a foot tangled with it and a considerable accident ensued when the throttle refused to shut. Her face was lacerated by barbed wire after going through the hedge beside the finishing straight. The war ended motoring sport and May then drove Army Staff-cars, including Jeeps. Between the wars the family cars had been a Star, probably the same one that Harry raced, an Invicta, and then a Ford V8. There had been flying from the Lancashire Aero Club at Woodford, where Avro Avians had replaced the Avro 504s. To meet wartime restrictions the Ford V8 was replaced by a more economical Ford Eight and there was a 350 cc Cotton-JAP which Tim Millington remembers being taken to school on, ridden by his mother. Jeeps fascinated them both; Tim's first driving experience, aged about 13, was in such a vehicle. Both Jack and May competed a little after 1945. Jack rode a 7R AJS in the Manx Grand Prix in 1949 and used the faithful SS100 Brough in speed events, sometimes with Shirley, his second wife, in the TT Hughes sidecar. May was thrilled when Francis Beart offered her a drive in his Cooper-Norton at Brighton Speed Trials in 1953, although she was disappointed to be slower than Stuart Lewis-Evans, with whom she shared the car. Tim Millington had inherited the family's interest with competition motoring and he began to ride in trials around 1950 on a modified ex-WD 350 cc Ariel. He then moved on to scrambles, with a circa 1935 KTT Velocette, which was not well-suited to such undertakings, although it had been altered for grasstrack racing by the previous owner, who had endowed it with telescopic forks and swinging arm rear suspension, and it had knobbly tyres. It was taken to events on the sidecar of a late-1920s Coventry-Eagle Flying-8, with the side-valve 1000 cc JAP engine. "Great fun!" Tim recalls. From the mid-to-late 1950s competitions were forsaken, but there were enjoyable runs in his 1938 Meadows-engined HRG. A move to Warwickshire then brought him into contact with North Star Engineering, run by Ron Robinson, Bill Belcher et al, and Tim became junior assistant mechanic, on their Coventry-Climax-engined Lotus XI project. After the Lotus had been sold Tim and Bill bought a Terrier Mk2, designed and built by Len Terry for 1172 Formula racing but given a Ford 105E power unit to comply with the then current Clubmans Formula. It had a BMC A-series gearbox and back axle. They both raced the Terrier in 1962 and 1963, and had reasonable success, and Bill Belcher found that he could lap quicker than he had in the Lotus, thanks to superior tyres and suspension. With twin SUs instead of Webers, it had less power, not to mention a live axle and drum brakes. 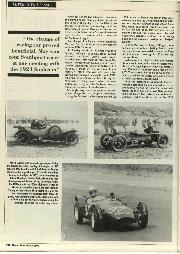 Before this, Ron Robinson and Tim Millington had bought the ex-Emeryson Meadows Frazer Nash, recently acquired by Chris Gordon, a car with which Ron was conversant, because for many years he had had a 1932 Exeter model. At this stage both felt that the Hillman Imp had potential and, as they worked at Rootes and Ron was an ex-Rootes pupil, they proceeded to exploit the light-alloy engine's possibilities, being among the first to enlarge it to 998cc. They used four Amal carburettors, which were cheaper than Webers but not too reliable in respect of linkage. It made for a quick car, but when Ron's Formula Junior ambitions came to fruition around 1965 they sold the Imp to Bob Driver, who installed Lucas fuel-injection which made it much faster. The FJ car, called the FRED (Ford Rear-Engined Device), proved to be too heavy and too late on the scene, and as Tim had just got married he didn't race it. It was given a Shorrocks-supercharged 1500cc Ford engine and is still about. Incidentally, Tim Millington wrote the standard reference work on how to maintain, and more particularly how to hot-up, the fascinating little Hillman Imp, which made his mother justifiably proud. By the 1970s, Tim started to do Production Car Trials, passengered by his wife Marian and their two small sons. The car they used was another 998cc Imp. This resulted in Tim's elder son Peter following in the family wheeltracks - the fourth generation after he had got motorcycling out of his system; his mounts had included a 750cc Kawasaki. He then bought a Clan Crusader - Imp-powered, of course! - which in 1990 was used for his toe-in-the-water half-season. But after that more development of the car, mostly by Peter himself, produced some quite successful results. For instance, the Crusader was a class-winner in the CCC/BARC Speed Championship and second in its class in the Gurston Down Championship. Peter's father drove the Clan in three of these events, more sedately, he says, than his son. Last year there was a close second-place at Gurston, Peter established the class record at Curborough, and altogether he enjoyed eight class wins, four second places and the same number of thirds. Not a bad show, for an amateur father-and-son combination, without sponsorship. This season, with more power, and lightened, the Clan Crusader will contest the Leaders and the Midland Hillclimb Championships. So there you have it - four generations of motor-sporting enthusiasts. It is possible that someone will come up with five, because this family only took to motor racing in the 1920s, but I doubt it . .